Assassin's Creed III is a masterful interactive take on Revolutionary America. Not only is it expertly crafted and thoroughly engaging, but there's a ton of content to keep players coming back for more. History is both a beautiful and tragic thing. Looking back throughout our kind’s lengthy history, one will find text regarding great achievements, amazing victories and incredible people; however, the very same books also tell tales of war, poverty, murder and unfortunate events that are sadly in a league of their own. In order to fully understand where we’ve been and what we want out of the future, it’s important to analyze both sides of our predecessors’ tales, which will allow us to learn from their mistakes. At least, that’s the result we hope for. Although schools, libraries and living veterans are great sources for varied types of historical teachings, those options are not taken advantage of nearly enough. Thankfully, some of the film industry’s major figures have attempted to teach through celluloid, with the same being true of the video game medium. Although there aren’t as many interactive options within that specific category, things have certainly improved over the last while, thanks to the History Network’s attempts, as well as Ubisoft’s incredibly popular Assassin’s Creed franchise. As a community of likeminded people, we gamers were recently gifted with a brand new iteration in the aforementioned action-adventure franchise. Released as the brand’s second sequel, Assassin’s Creed III has set the industry on fire. Millions of people are talking about the title, and for good reason, as it’s an incredibly ambitious project, not to mention a masterpiece. Yes, it truly is that good. This time around, the narrative transports us to the 18th century, where civilian unrest within Britain’s American colonies is getting ready to pique. The story begins before the American Revolutionary War truly kicks off, and then chronicles some of the conflict’s major players and battles, through the use of a brand new hero. A mixed heritage native who possesses a Caucasian father, our new protagonist goes by the name of Connor for convenience purposes. However, despite the fact that he’s left his birth name on the back burner for a while, that doesn’t mean that he’s abandoned his people. In actuality, his interest in protecting his fellow natives is what gets him involved in noteworthy events surrounding the aforementioned war. Getting into specifics regarding the plot would be blasphemy on my part, because it’s an incredibly wild and interesting ride that all gamers should experience for themselves. Though, with that being said, it’s important to note that the American Revolutionary War isn’t the only conflict to be found within what is a well-written, interesting and historically based campaign. Expectedly, Assassin’s Creed III continues the tale of the Assassins Guild and its ongoing battle against the Templars, who seek to morph the world using their own ideals. As such, Connor’s quest mainly centres on high value Templar targets, although he’s not introduced until a little ways into the story. Despite being Canadian, I happen to have an affinity for American history, which helped make this particular release my most anticipated game of fall 2012. Thankfully, it didn’t disappoint on the historical level, viscerally and audibly presenting the period with class, dignity and quality. Sure, Connor may not have existed, but a lot of the people featured within this game did. Crafted around documented records, they, along with the cities of New York and Boston, combined to create an experience that felt authentic despite its fictional influences. The world always felt alive, and there were tons of things to see and do. Taking those factors into consideration alongside the many hours of research that the development team obviously did, made for a proud play through. It’s amazing to see how far this industry has come with regards to storytelling. While an interesting storyline is a major part of the video game formula, the gameplay department is definitely more important. There’s no need to worry about whether the Assassin’s Creed III development team understood that or not, though, because what they’ve crafted plays just about as well as it looks. Traversing Boston, New York and the wooded frontier lands is easier this time around because the controls have been streamlined. Instead of having to combine buttons to climb, one must only hold the right trigger to engage those actions within Connor’s tale. The decision to make that change increases the title’s accessibility factor, and it’s a change that shouldn’t bug seasoned gamers, because it’s a positive one. 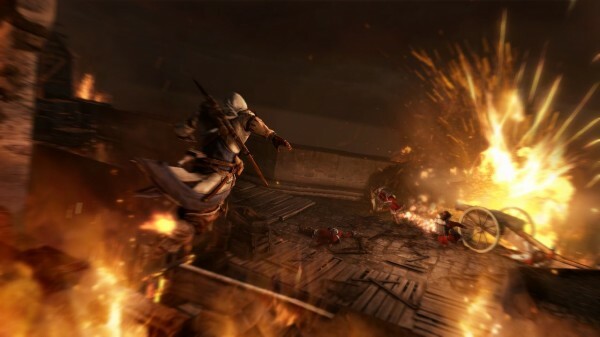 Now, assassins can move throughout different landscapes with a lot more ease and efficiency. The combat mechanics have also been altered, making fights more challenging, and much more strategical. Employing a system that is somewhat similar to what you’d find in one of Rocksteady’s Batman games, it tasks players with being aware at all times. Foes will attack at random, and icons will appear over their heads. Countering can be completed through the press of a button, with different options available afterwards. For example, one button allows players to attempt to attack after a successful slow motion counter, while another offers the chance to take the baddie’s weapon away, rendering him defenseless. Both work well, though they’re not always successful, and large-scale encounters present a hefty challenge. Thankfully, Connor is an efficient swordsman, and is also effective with his secondary tools, including pistols, smoke bombs, dagger-emblazoned rope and more. Needless to say, there’s a lot of player choice to be found within. 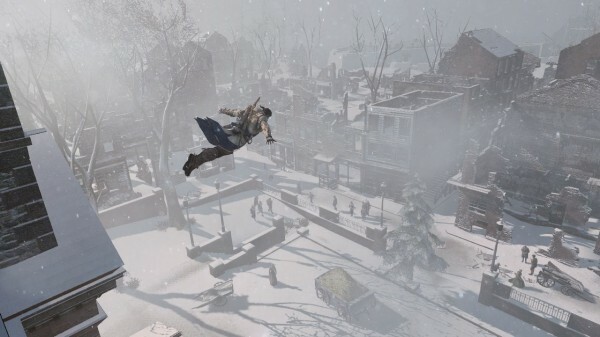 Melee battles play a large role in Assassin’s Creed III, just like they did in previous series entries, though stealth is also a major component. Every sequence challenge comes with at least one secondary objective, and those who wish to end up with a 100% sync result at the end of the game will need to abide by them all. It’s easier said than done, as it’s tough to complete difficult tasks without being spotted or engaging in combat, and those are two prime examples of secondary conditions. The series’ well-known stealth mechanics haven’t changed much, and that’s fine. There was really nothing wrong with them in the first place. As long as you’re smart about where you run, jump, climb and kill, you shouldn’t have to restart too many checkpoints. Granted, there were a couple of frustrating moments where I had to do that because of movement glitches – mainly pertaining to employed horses, which would get stuck on rocks – though those occurrences didn’t detract much from the overall experience. It’s to be expected that there will be occasional glitches within such a large-scale game, and Ubisoft’s latest triple-A title isn’t devoid of them. None of the noticed glitches were major, though, so I’d say that the testers did a good job. Complementing all of the gameplay descriptors mentioned above is a wealth of content. 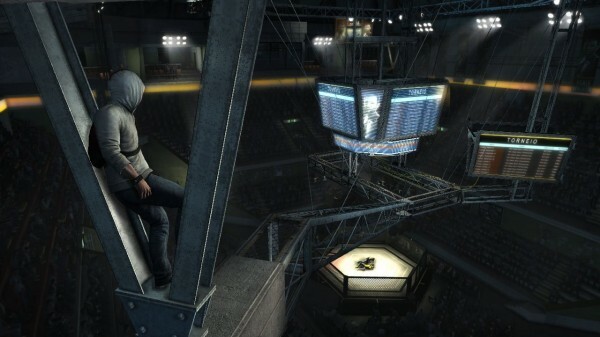 The familiar viewpoints, citizen missions and Desmond story missions have returned, and they’re all quite impressive. 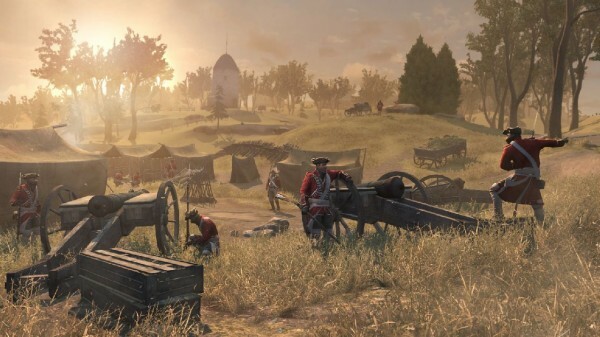 On top of those options, Assassin’s Creed III boasts area liberation quests that allow players to recruit assassin trainees who can be sent out on missions, along with challenges, a full-fledged hunting scenario complete with trade-able pelts, and a separate naval campaign. That’s a lengthy and varied list, even though it’s missing one other important secondary quest: building up the local wilderness into a thriving village filled with friendly people who can provide unique assets such as food, clothing, lumber and ore. While the homestead missions are great, the naval quests take the cake. There’s simply nothing like what that particular facet of this experience presents, because it’s so well-made and feels quite realistic, despite its health bar usage. 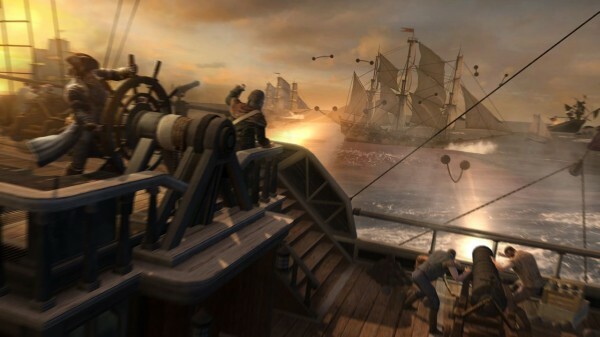 Taking a ship out onto the open water, where enemies must be dealt with through the use of cannon balls and other nasty weaponry, is an absolute blast. Success depends on being strategical and also knowing how to take advantage of the ship’s full and medium sail settings. Make sure to practice with both, because the intense seafaring battles require quick thinking. Of course, you’ll also come across the odd side mission where you can simply take the ship to a chosen destination, where a hidden treasure may reside. Simply put, the single player portion of Assassin’s Creed III is a memorable masterpiece, which is only affected by minor issues. The seventeen hours that I put into completing the core experience, plus a hefty amount of side quests, were well spent within what is an incredibly immersive experience. Thankfully, a similar level of quality is extended to the multiplayer side of things, where players must attempt to take out specified targets by using their Sherlock Holmes caps. Every round I played was fun and full of polish, and it didn’t matter which mode was selected, as the competitive offering is both fine-tuned and robust. The development team’s attention to detail was referenced earlier, and it’s worth bringing up again. That’s because it’s time to talk about the game’s presentation, which is close to top-notch. Visually, Assassin’s Creed III is a treat, with its detailed character models, visceral landscapes and its incredible amount of animations. Adding on to those standouts is a brand new weather system that brings rain, snow and thunderstorms to both Boston and New York, not to mention the frontier lands. The storms illuminate the areas impressively, presenting a different look for the timely buildings that the developers crafted and positioned based on maps from the period. On the audible side of things, players will discover an amazing score, as well as some great voice acting and realistic sound effects. For the most part, the game is loud, boisterous and impressive in its audio scope. However, there was one noticeable issue pertaining to some of the characters’ lines. In fact, it seemed as if some of the settlers’ voice work was recorded at a lower volume than the other characters’ dialogue. It was tough to hear them at times, as the music would overpower their lines a bit. Subtitles helped keep that from really affecting the immersion, although the problem was somewhat annoying. Although it’s not perfect, Assassin’s Creed III is a masterful interactive take on Revolutionary America. Not only is it expertly crafted and thoroughly engaging, but there’s a ton of content to keep players coming back for more. As such, I find it incredibly easy to recommend this sequel to all gamers who happen to be in the market for a rich action-adventure experience. The marketplace hasn’t seen anything like this before.